I played Sea Stars for the first time last week on the iPhone. I was immediately impressed by the colorful graphics. The graphics alone put me in a happy mood. Everything is so bright. That said, while it’s neat to be amongst tropical islands, an enormous smiling sun and palm trees, Hothead Games could have done a little better on the definition. I kind of have a love/hate relationship with the graphics, but it’s more love than hate. 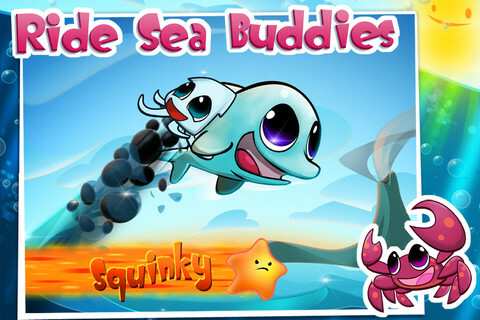 What stood out most about Sea Stars is that it’s very similar to Jetpack Joyride. If you’ve ever played Jetpack Joyride on your iPad then you should have no problem getting the hang of the controls for Sea Stars. Not only are the controls very similar, but so is the interface. The coolest aspect of Sea Stars is the fast pace. As a dolphin or another Sea Star, I can leap from the water to make rainbows, do tricks and dive deep into the water for even more speed. All of this is done while trying to collect coins. By the way, if you have trouble finding coins, be sure to look in the clam shells. Once you complete a mission, you will move on to the next one. I like the interface for the missions. For instance, one screen will list three missions very clearly. The first is Collect 3000 Coins. How many you have left to collect will in parentheses, which is nice for clarity. The second mission: Travel 400 Meters With Dr. Scuttle in One Swim. The third mission: Collect 3 Shell Prizes In One Swim. All of these are fun. When you complete a mission, you also get to level up your character, which is neat. You start out as Dante the Dolphin and you can go as far as Niji the Narwhal, which costs 800,000 points. I really like the interfaces for Sea Stars. They’re very impressive. I especially like the look on my iPod Touch. My favorite area is the character interfaces. You can get clear descriptions and capabilities for each character. It’s the overall simplicity and vivid colors that make this area so appealing. Strange since it’s not an action part of the game, but you will most likely feel the same way. As far as cost goes, the Sea Stars iPhone app is only $.99, which is more than fair. It has quickly become my favorite application. On the other hand, I’m a seasoned gamer and I know that I won’t have much trouble beating this game in a short period of time. Once that’s done, I’m done. For the average gamer, it’s excellent. For the serious gamer, it’s good, not great. 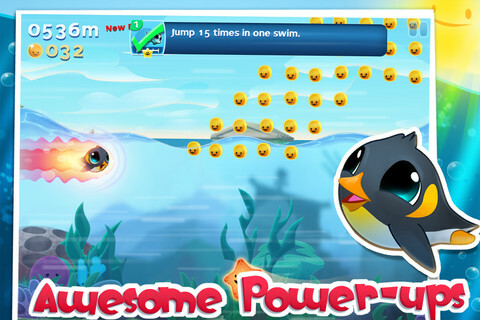 AppSafari review of Sea Stars was written by Darius Reimm on December 6th, 2011 and categorized under App Store, Arcade, Games, Scrolling Shooter. Page viewed 4900 times, 5 so far today. Need help on using these apps? Please read the Help Page.